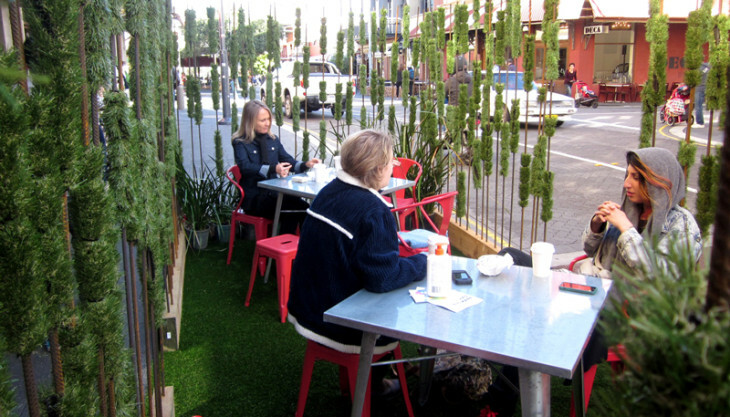 In conjunction with the Fremantle Council, Ecoscape has organised Fremantle’s first Park(ing) Day which was bigger (and some would say better!) than Perth’s modest two bays. With Mayor Brad Pettitt’s enthusiasm and assistance, we managed to organise five parking bays that were transormed into mini urban parks for the day. Xray Café created a park in front of their establishment, the Living Smarties and Ecoburbia created two spaces, one behind Gino’s in Market Street and the other on High Street. Ecoscape secured a bay on Market Street near the Newport, and CUSP added to their permanent aquaculture display in front of their building on Packenham. Participants enjoyed a place to sit, relax, contemplate and interact with one another with coffee and food, live music, farm animals, games and a sand sculpture. With the development of King’s Square looming and fervant discussion surrounding the direction of Fremantle’s future, Ecoscape thought this a good opportunity to promote thought and discussion around the idea of urban open space and to challenge current assumptions about traditional models of development. Since 2005, the project has blossomed into a worldwide grassroots movement: PARK(ing) Day 2011 included 975 “PARK” installations in more than 160 cities in 35 countries on six continents. This year, the project continues to expand to urban centers across the globe. PARK(ing) Day is an “open-source” user-generated invention created by independent groups around the globe who adapt the project to champion creative, social or political causes that are relevant to their local urban conditions. More information regarding local PARK(ing) Day activities can be found in the attached pdf and a global map of all participating cities are available on the PARK(ing) Day website, at parkingday.org.